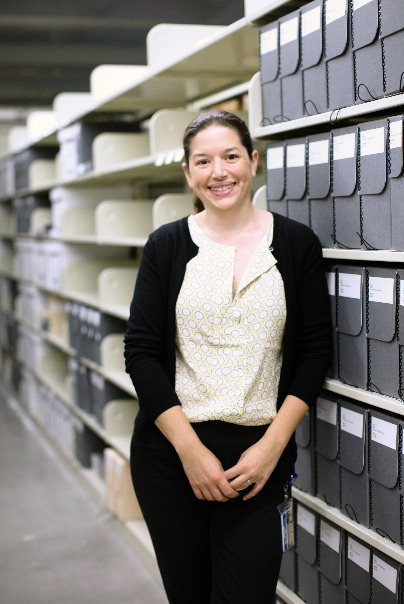 In her first few months on the job, University Archivist Teresa Mora has set out to change the way faculty, staff, and student organizations handle the dusty piles of accumulated papers and digital folders stashed away on forgotten hard drives. For Mora, the first person to hold the newly created position of campus archivist, the essence of UC Santa Cruz’s 51-year story is in the details—the newsletters, meeting minutes, images, correspondence, and dog-eared reports stashed away in forgotten boxes. Her campuswide campaign is aimed at reminding people that one’s recycle bin could be an archival treasure. People often think their documents don’t matter but these seemingly mundane pieces of history may illuminate the unique history of the campus, Mora said. To amass and organize materials for campus posterity is no small task, especially at the end of the year as retirees prepare to leave campus, and staff and faculty work to clear the clutter of a busy year. Of particular interest are the programs that were cutting edge offerings when they were first created and reflected the culture of the campus, such as Feminist Studies, Community Studies, the Center for Agroecology & Sustainable Food Systems, the Chicano Latino Research Center, and the Joseph M. Long Marine Laboratory. The new wave of archival practice involves organizing the massive amount of digital content now created, which may involve capturing old websites and digital correspondence, as well as photos, video, and audio files. “We can’t take everything but we want to have the broadest potential for storytelling,” said Elizabeth Cowell, Richard L. Press University Librarian and Presidential Chair. While the university has a diverse trove of special collections and has collected pieces of campus history over the years, this is the first time the university has had its own dedicated archivist to build a more comprehensive campus story. The importance of the position became critically apparent as the campus prepared for last year’s 50th anniversary. The long-awaited position was made possible through a generous donation by the Webster Family Foundation, which endowed the university librarian position through the Presidential Chair program of the University of California Office of the President. Alec Webster (’02, College Eight) and his wife, Claudia Webster, wanted the gift to create the university archivist position as they have a particular interest in campus history. The gift is part of the Campaign for UC Santa Cruz, which supports excellence across the university through increased private investment in the people and ideas shaping the future. Long-standing campus benefactors, the Websters have contributed to many vital campus projects including the renovation and programming for the Cowell Hay Barn at UC Santa Cruz. Collections are arranged and described for use by the campus community, outside researchers, and the general public. Many of them are digitally available as well. “The impact of this position is far more valuable than the amount of the gift,” Cowell said. In addition to documenting the past, Mora is trained to identify key materials of the campus story as it unfolds. She scans the calendars for campus events to make sure documentation makes its way to the archives.